Each year, college students are injured and killed in preventable campus-related fires. To prevent injuries and fatalities caused by fires that occur in college residence halls, off-campus housing and fraternity/sorority houses and to raise awareness about life-saving fire prevention knowledge as students head back to school, ASSE, West Virginia University (WVU), RA Fire Academy and the Morgantown Fire Department are providing key fire prevention information and demonstrations. According to NFPA, from 2000 to the present, 146 students have died in a combination of off-campus, residence hall and fraternity/sorority fires. The majority of campus-related fatal fires occur in off-campus housing. According to the U.S. Fire Administration, of the 146 campus-related fire fatalities that occurred from January 2000 to the present, 85% happened off campus. Today, more than two-thirds of the U.S. student population lives in off-campus housing. WVU’s Department of Environmental Health and Safety (EH&S) recognized the importance of having a strong, vibrant fire safety program. The RA Fire Academy evolved out of several training sessions the department offered for the students, campus community and local high schools in the area. By working collaboratively with various university departments, administrators, student staff and the Morgantown Fire Department, the RA Fire Academy was created. 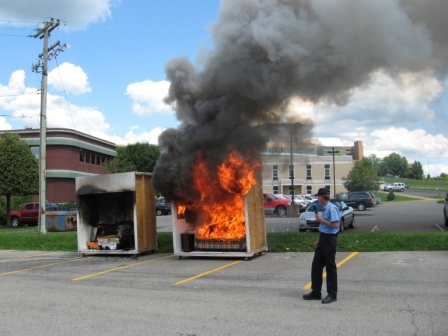 Some form of this fire safety training has been offered since 2003 to students in the campus community. WVU EH&S envisions offering this fire academy training to all first-year students. • live burn (A mock dormitory room is constructed with the appropriate early warning fire protection. The room is then set ablaze. Students observe how quickly a room is engulfed with smoke and flames; and, they learn the importance of smoke detectors, evacuation and sprinkler systems. Additionally, the importance of using open flames with caution is discussed.). Each RA rotates through each training station. The training culminates in the sixth station where a dorm room mockup is lit, and students are able to see just how quickly a dorm room fire can spread. The overall goal is to provide each RA a rounded training session. The RA Fire Academy is intended to provide student leaders with the necessary knowledge and skills to better enable them to assist others in the event of an actual fire emergency on campus. The goal is to give them some real life hands-on experience in a safe and controlled setting so if they are ever faced with a real fire emergency, they will have the confidence to make the right decisions in a quick, calm way and hopefully save lives. This entry was posted on Saturday, January 21st, 2012 at 9:47 pm and is filed under Uncategorized. You can follow any responses to this entry through the RSS 2.0 feed. You can leave a response, or trackback from your own site.